Guilin is so much more than just it’s namesake city. Over the years the name Guilin has become synonymous with not just the city of Guilin, but the entire surrounding area. Draw a 100-kilometer radius around the city and you’ve got the part of China now commonly referred to as Guilin. Bare with me guys. I know it sounds a bit confusing at first, but when you think about it, it’s much easier to condense the entire area down into just one name than it would be to list every town, mountain, and river worth visiting. I guess the naming problem we’ve run into is that there’s no designated name for that general area, so it’s just gone by the name of the biggest and most centrally located city, which is, of course, Guilin. There is a reason behind this tangent, I promise you, and that is that most of the best things to do in Guilin aren’t actually located in the city itself. In fact, you could go to Guilin and be exploring for days without ever stepping foot in Guilin City. You’d probably prefer that actually if you’re outdoorsy folk like ourselves. 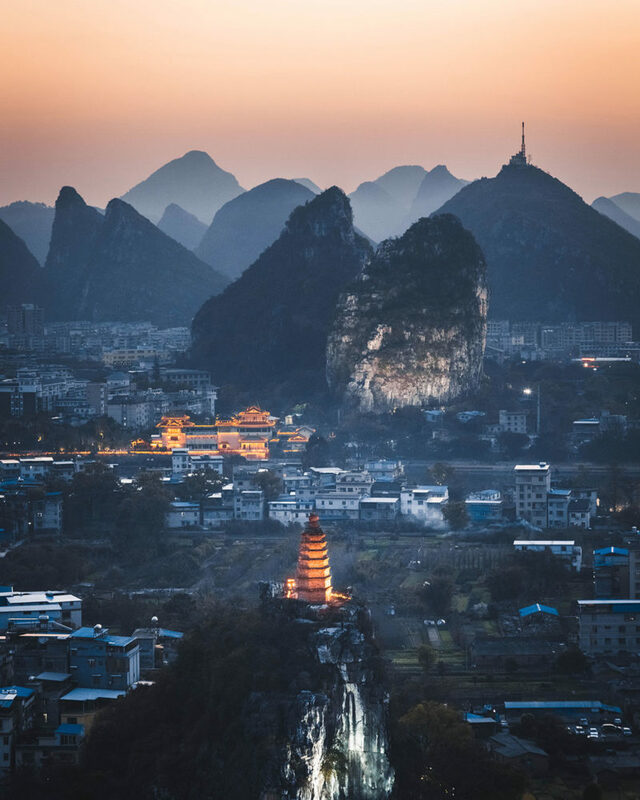 To take some of the confusion out of it, here are the major towns lumped into the name “Guilin”, Guilin City, Yangshuo Town, Xingping Old Town, and Longsheng Town. I’ll be breaking this list down into sections so you guys will know what’s located where. 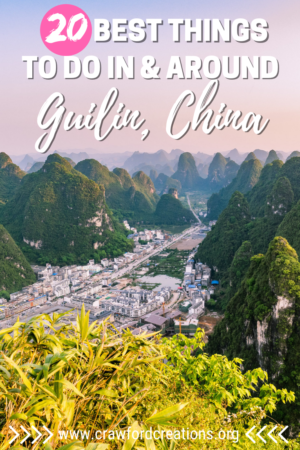 Also, know that while you can (and should) stay in one of the other towns on this list during your trip, all of the things on this list are accessible within a day trip from Guilin City. Ok, now that we’ve got the logistics out of the way let’s dive into the fun part, all of the amazing things to do that await you in Guilin. It only seems fitting to start with the area’s famous namesake city, Guilin. The capital of Guangxi Province in southern China, Guilin is located on the banks of the Li River surrounded by stunning karst mountains. It’s without a doubt one of the most scenic cities in China and definitely worth a look when traveling around the area. The Sun and Moon Pagodas are without a doubt the most famous man-made sites in Guilin. 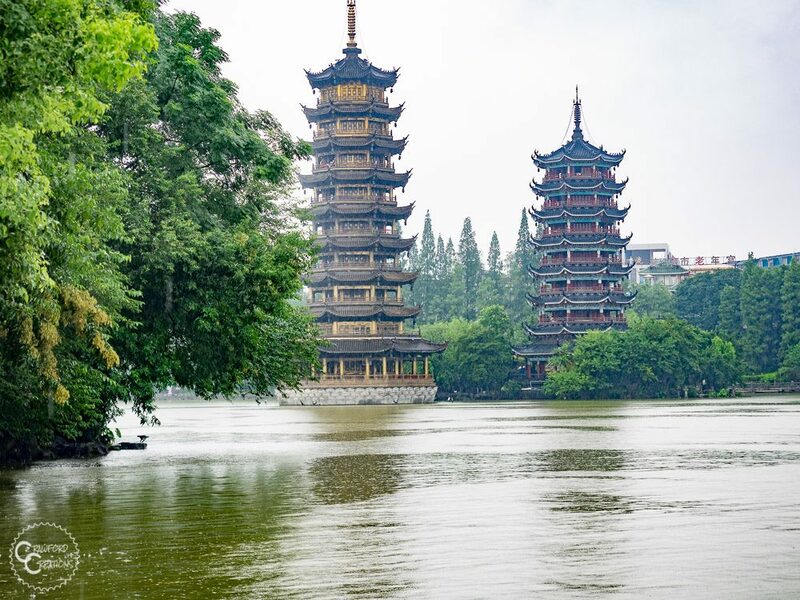 They are a pair of pagodas located in the middle of Fir Lake right in the heart of Guilin City. The sun and moon demonstrate the Chinese concept of yin and yang and the pagodas as a whole symbolize the livelihood of the city. Simply walking around the lake is a great way to spend an hour, but if you want you can also pay to go inside the pagodas. There’s supposedly a tunnel that connects the two pagodas together underneath the lake and the sun pagoda even has an elevator in it where you can ride to the top and check out the view. Zhengyang Pedestrian Street is a huge maze of shopping and food streets that are completely blocked off from vehicle traffic. The area is home to countless souvenir shops as well as excellent street food. 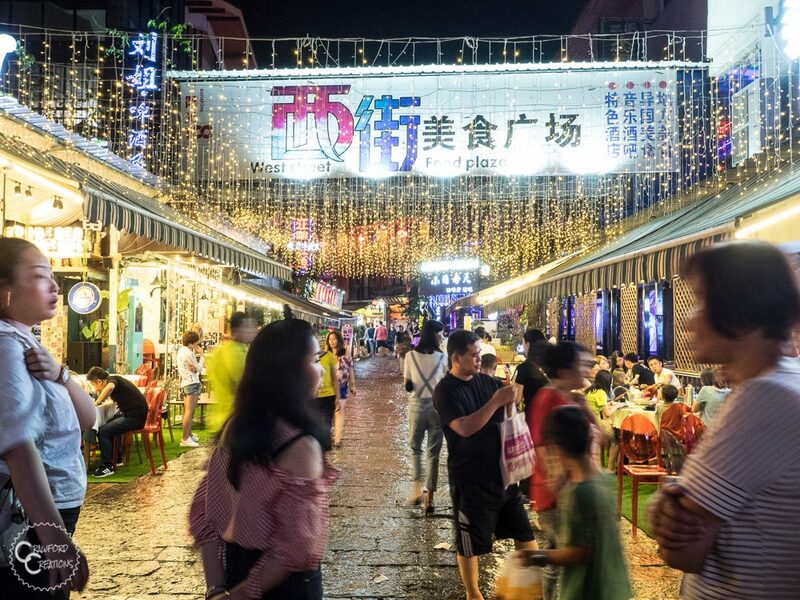 Zhengyang Pedestrian Street is THE place to go for an awesome meal in Guilin. And if you’re adventurous enough you can even try some more bizarre Chinese specialties like scorpions on a stick! The pedestrian streets are most lively at night, so to get the most out of your experience be sure to go in the evening. Don’t be shy about trying street food here in Guilin, it’s very safe, and super delicious. I’d be remiss if I didn’t put Guilin’s famous Seven Star Park on this list as it’s probably the most epic city park in all of China, but all that epicness comes with a steep price tag. Entrance to Seven Star Park will cost you 70 Yuan, and that’s not including the popular Seven Star Cave which has an additional entrance fee. If you’re on a budget, I’d skip it, but if not, I would definitely check it out. It’s a really cool park and a great way to spend the afternoon. Attractions in the park that are included in the entrance fee are Flower Bridge, Camel Hill, a cool waterfall that I don’t think has a name, and a nice manicured Chinese garden. Located just up the road on the other side of the river from Seven Star Park, Diecai Hill has one of the best views of Guilin City. The mountain consists of 4 separate peaks, the highest of which is 223 meters tall. Stone steps lead up the mountain to each of the peaks. There’s also a cave that carves a hole through the middle of Diecai Hill. The cave is aptly named Wind Cave as the wind blows through it all year long. The cave is shaped like an hourglass with the middle only allowing for one person to pass through at a time. The cave, in addition to being windy, is filled with rock carvings from the Tang and Song Dynasties, nearly 100 of which depict Buddha. Head up to Diecai Hill in the early morning or evening for spectacular sunrise/sunset views over the city. Chuanshan is another awesome viewpoint in Guilin. Located just down the road from Seven Star Park, Chuanshan Scenic Area consists of 3 separate mountains, Tunnel Hill, Pheasant Hill, and Pagoda Hill. 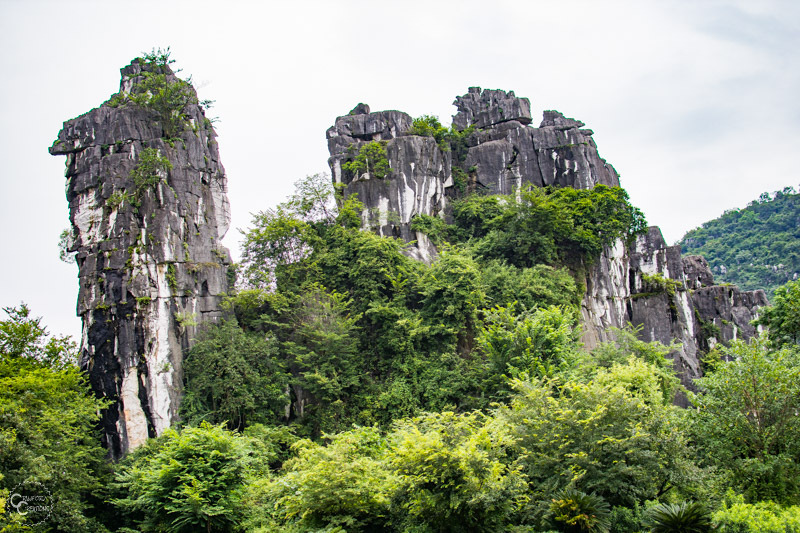 These mountains not only offer incredible views over the city of Guilin and the beautiful Li River, but they also consist of two caves, Chuanshan Cave and Moon Cave. Chuanshan Cave is huge, measuring 1.5 kilometers long, and, in typical Chinese fashion, is adorned with colored lights along the walls. The best view from Chuanshan is looking out over Pagoda Hill onto the Li River with the city and mountains in the background. Unfortunately, this view comes at a rather steep price for what it is, so again, budget travelers beware. At 30 kilometers away, while not technically in Guilin City this quaint little countryside village definitely holds its own in terms of awesomeness and 100 percent deserves a spot on this list. If you’re looking to get off the beaten path, experience rural farm life, see some beautiful scenery, and take absolutely epic photos, than Tianxian Village is the spot for you. The best way to get here is to hire a driver as it’s a bit hard to find on your own. China doesn’t make it easy as there are 3 villages all named Tianxin Village around Guilin and you have to know the right one to go to. It’s about an hour drive to get here, but it’s oh so worth the drive. 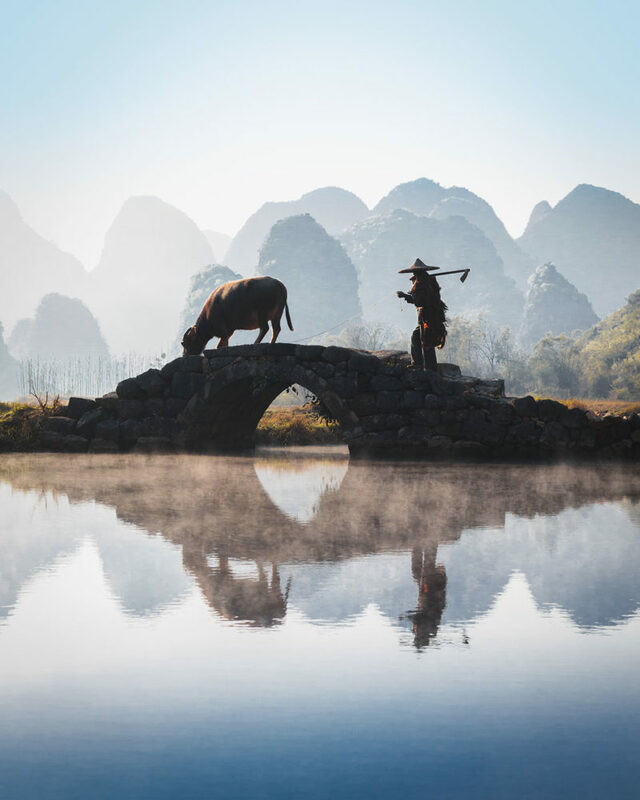 It’s best to go early in the morning to catch the farmers heading out to the fields with their buffalo walking over ancient arched stone bridges over the rivers and through endless rice fields. It’s an incredibly picturesque place that will make you feel like you’ve gone back in time. 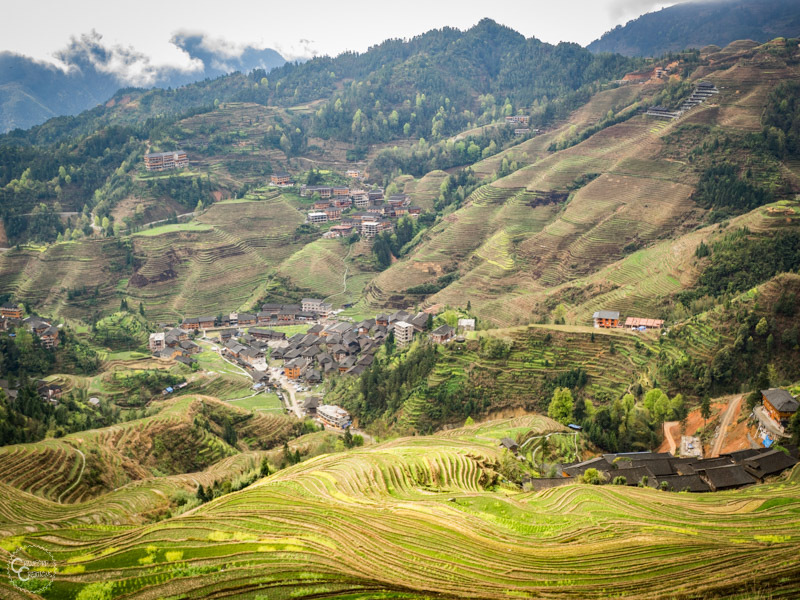 Longsheng is home to the incredible Longji Rice Terraces (Dragon’s Back Rice Terraces). 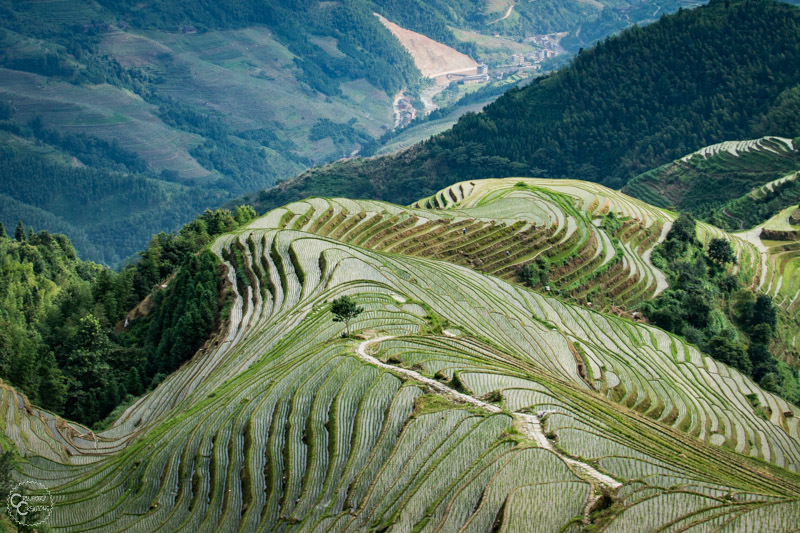 The Longji Rice Terraces are arguably the most impressive rice terraces in all of China. The rice terraces are carved into the mountains, interrupted only by clusters of stilted wooden villages clinging to the mountainsides. The town of Longsheng and the entrance to the rice terraces is located 80 kilometers north of Guilin City. The Longji Rice Terraces are broken up into two sections, Dazhai (Jinkeng) and Ping’an. The Dazhai Rice Terraces, also known as the Jinkeng Rice Terraces, are made up of several different small villages dotted throughout the valley. The two largest and most well-known villages in the valley are Dazhai and Tiantou village, both of which have hotels and restaurants where tourists can stay and enjoy the amazing views. The Dazhai Rice Terraces are larger and more impressive than the Ping’an Rice Terraces, although both are incredibly beautiful in their own rights. Ping’an Village is often touted as being more commercialized than Dazhai, which is kind of true, but there is a cable car that runs from the entrance up to the top of the Dazhai Rice Terraces, so it’s not like Dazhai is completely untouched by tourism. Paths crisscross the rice terraces between all the different villages making for some incredibly scenic hiking trails. There are 3 different mountaintop viewpoints at the Dazhai Rice Terraces that are all amazing photography spots, Golden Buddha Peak, Thousand Layer Terraces, and West Hill Music. Click here for a map of the hike. The Ping’an Rice Terraces consist of just one larger village called, creatively enough, Ping’an Village. Just like at the Dazhai Rice Terraces, the Ping’an Rice Terraces has 2 viewpoints you can hike to to get the best views of the rice terraces, the Seven Stars Around the Moon Viewpoint and the Nine Dragons and Five Tigers Viewpoint. Ping’an Village is said to be more commercialized than the Dazhai Rice Terraces because it’s got significantly more hotels, lots of restaurants, and even some bars so you won’t miss out on any nightlife. This section of the Longji Rice Terraces definitely caters more towards tourism than the Jinkeng section, but that doesn’t mean that you won’t find incredibly authentic, local experiences and beautiful rice terraced views just like in neighboring Dazhai. If you’re an avid hiker, in addition to hiking up to all the different viewpoints, you can also do a longer hike from Ping’an all the way over to Tiantou Village at the Dazhai Rice Terraces. The hike is a total of 10 kilometers (?) through the mountains with absolutely stunning views along the way. This is an entrance fee to the Longsheng Terraced Fields Scenic Area and is a flat fee that covers both the Dazhai and Ping’an Rice Terraces. Tickets are good for two full days from the date of purchase. Xingping is a small town located 70 kilometers from Guilin. These days it’s known as the Yangshuo of years passed, aka the quaint little old town that Yangshuo used to be before it got engulfed by tourism. Xingping is a super small, super cute, old historic town located right on the bank of the Li River and surrounded by some of the most incredible karst mountains. Xingping might be small, but it is definitely worth a visit. The best bamboo rafting route starts not in Xingping but at Yangdi Pier a few kilometers up the river. 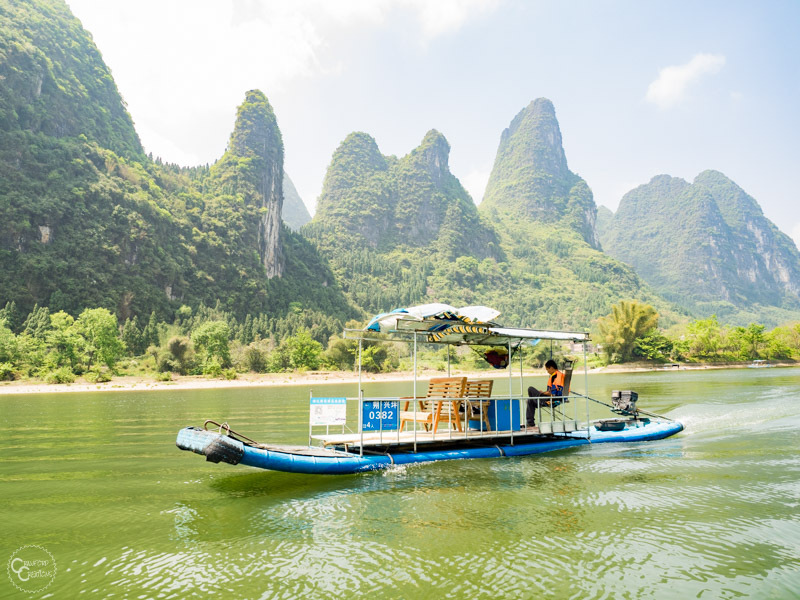 Taking a bamboo raft from Yangdi Pier to Xingping takes you down the most scenic section of the Li River past incredible mountains and famous rock formations. These days the “bamboo” rafts are actually made of PVC and equipped with motors on the back, but it’s still an incredible experience and one of our favorite things to do in Guilin. The rafts leave from Yangdi Pier on demand from 8 am – 10 am and 12 noon – 3 pm. The break between 10 and 12 is to let the large cruise ships go by that are coming from Guilin. When you show up at Yangdi Pier, especially if you’re going in the afternoon, wait until a few minutes after 12 to buy your ticket. There’s always a huge line of people waiting for the rafts to start up again, which means that everyone ends up on the river at the same time, which can get quite noisy and crowded. But, if you wait 10 minutes for everyone else to get in their rafts and take off before buying your ticket you’ll end up having the entire river to yourself! Also, save your money and buy the ticket to 9 Horses Hill instead of Xingping. It’s only 1 kilometer short of Xingping and there’s a free shuttle golf cart that takes you from the end of the raft ride to Xingping town. Xingping Old Town is one of the most adorable old towns I’ve seen in all of China. It’s really quaint, but it’s just got so much charm and some really nice restaurants. Be sure to try the Special Eggplant, it will knock your socks off, trust me. When you take the bamboo raft from Yangdi Pier, you’ll get dropped off at the entrance to Xingping Old Town. Also, to eliminate any confusion, Xingping Old Town and Xingping are in fact the same place. The Old Town is just one part of Xingping, but it’s the town’s main attraction so the names are often used interchangeably. If there’s one thing you absolutely can not miss when in Xingping it’s hiking up Laozhai Mountain (Laozhai Shan in Chinese). This mountain has the most epic sunset view I’ve ever seen in my life. 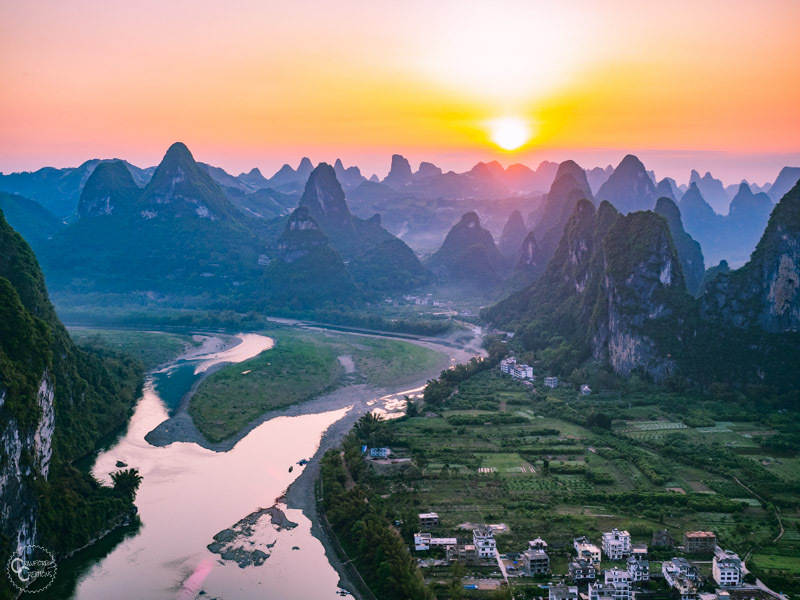 From the peak of Laozhai Shan you can watch the sun descend behind thousands of karst peaks as it sets over the beautiful Li River. The hike up Laozhai Mountain is via hundreds of stone steps built into the mountainside. It takes between 30-45 minutes to hike to the top depending on your speed. When you first reach the top of the stairs you’ll come out onto a viewing platform with a beautiful view over Xingping and the surrounding countryside. But wait, it gets better. You have not yet emerged up the most epic of sunset views. To watch the sunset in complete awe and amazement you’ll have to climb up the rocks next to the viewing platform and look out in the other direction. Don’t worry, it’s a short rock scramble, and you’ll have plenty of company at the top. It is the best sunset spot in the area after all. If you plan to stay on top of the mountain until the sun has completely finished setting just be sure to bring a flashlight for the hike down. The steps are not lit and the trail is completely shaded so as soon as the sun sets the path down is virtually pitch black. The steps leading up the mountain start just around the corner from This Old Place Hostel in Xingping Old Town and next to the ferry port/dock along the river. Look for the words Laozhai Shan painted on the wall with an arrow leading you up the stairs. Xianggong Hill is another epic mountaintop viewpoint located across and up the river from Laozhzi Mountain. While Laozhai is popular at sunset, the best views from Xianggong Hill are found at sunrise. Xianggong Hill is really well set up for photographers with nice big viewing platforms at the top with plenty of room for tripods and any other camera gear you may have. Like Laozhai Mountain, the route to the top consists of hundreds of stone steps. It’s a shorter climb though, taking just 20 minutes to get to the top. Located 30 kilometers south of Xingping and 70 kilometers south of Guilin, Yangshuo is definitely the tourist hot spot of the area, and for good reason. 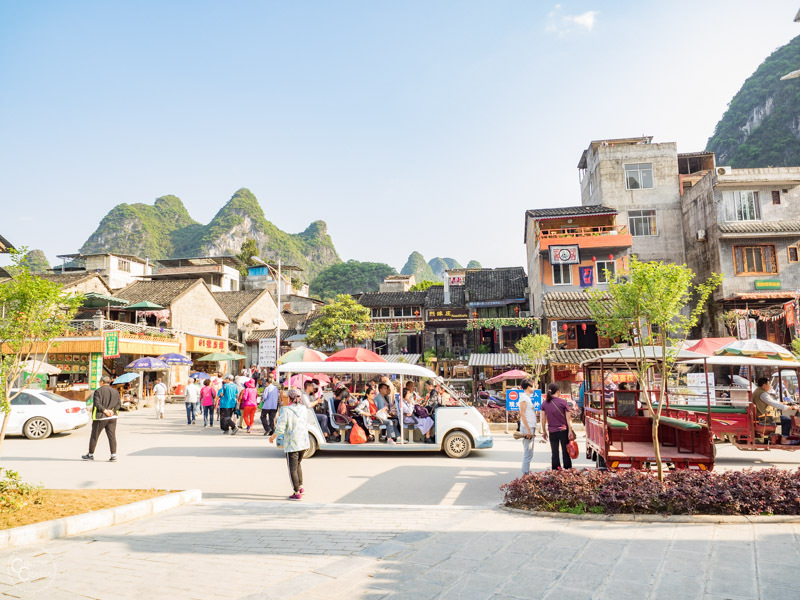 It’s not only located in the middle of beautiful karst mountains between the Li and Yulong Rivers but it’s got a hopping pedestrian street, lots of great restaurants, hotels, and of course tons of awesome stuff to do. 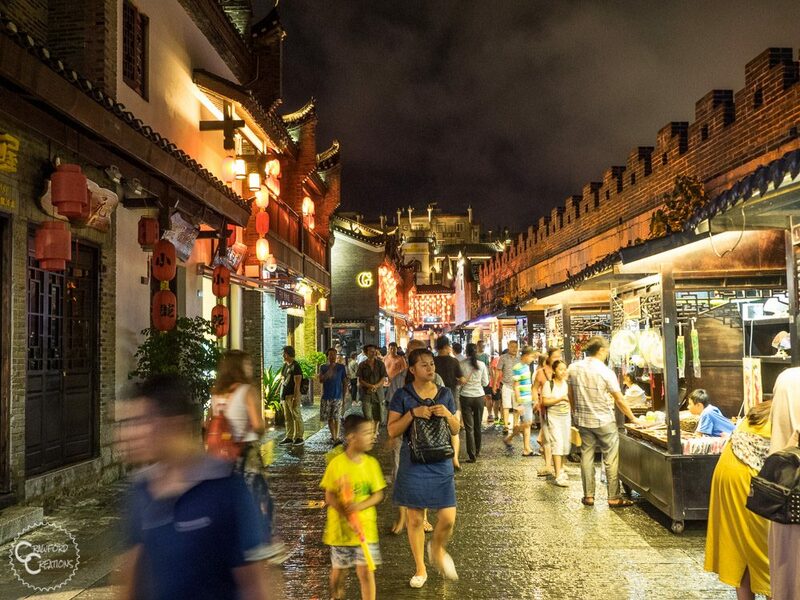 West Street is the start of Yangshuo’s epic maze of pedestrian streets. This pedestrian area is the place to go for all things from nightlife to great restaurants, street food, souvenir shopping, and even an underground Ice World. We came here every night for dinner while we were in Yangshuo as there’s both great Chinese and Western food. Beware of the crowds though. Even in the shoulder season this place is packed at night so be prepared to feel like a herd of cattle shuffling down the street. If you can only visit one cave in Yangshuo, Gold Water Cave is it. This place is incredible! Mostly because it’s got a mud bath and a hot spring inside of the cave. I mean how cool is that. It truly doesn’t get any better than relaxing in a hot spring inside of a cave. Both the hot springs and mud bath are pretty small, but surprisingly both times I went it wasn’t crowded at all. In fact, I had the hot springs practically all to myself! It seems that the Chinese aren’t down with changing into swimsuits and chilling out in a hot spring on their cave tour, so the mud bath and hot springs become a kind of informal foreigner’s only zone. While the Chinese might not be down with coming into the hot springs, as usual, they take no shame in staring at you bathing in the hot springs as they walk by. Just ignore it and be glad they’re not all in with you! While this cave lacks a hot spring, it’s got some cool features of its own to boast. The coolest of which is probably the waterfall that runs down into a pool inside the cave. Even though the other cave has water in its name, Silver Cave actually has more water flowing through it than Gold Water Cave. You just can’t go in the water, although I don’t know why you would want to, it’s freezing! You actually have to take a boat a couple hundred meters into the cave in order to start your walk. If you’re not familiar with Chinese caves, let me give you some context for how this cave going experience works. 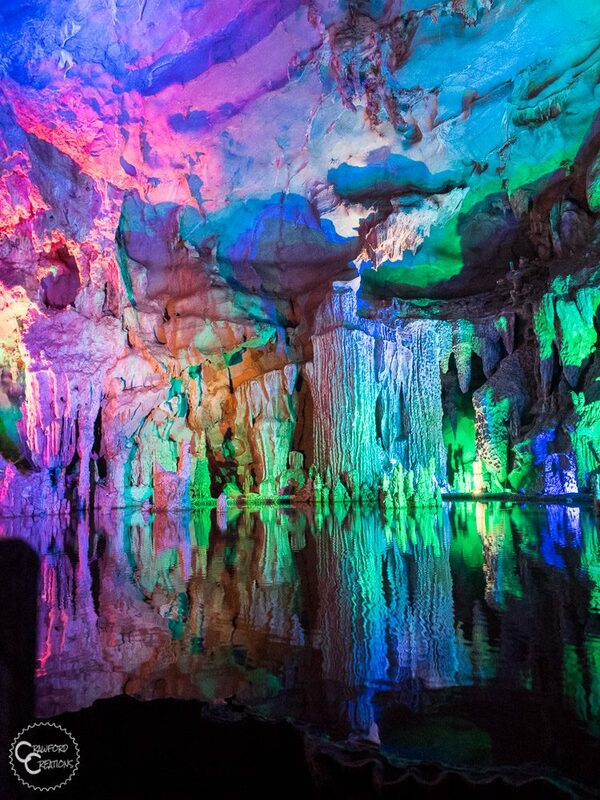 Unlike in a lot of other places, the Chinese love to light up their caves with multi-colored lights, some of which even change and dance around like a light show. When you go into a cave, the attendants will make you wait until there’s a sizeable group of people and then shuttle you through the cave as a group with a tour guide. I guess this is to keep people from wandering off inside the cave. Never have I ever gotten an English speaking tour guide, so don’t expect anything out of this tour unless you can understand Chinese. Pro Chinese cave-going tip, If you hang towards the back you can look around and take photos without other people in them, and also get a bit of a reprieve from the inevitably noisy Chinese tourists. I’m not trying to discourage you from touring the caves around Yangshuo, they’re amazing! In fact, they’re some of the largest caves in the entire world and they’re really impressive to walk through, even with all the colored lights and loud tourists. I just want to put the experience into context so you can set your expectations. These caves are not an off the beaten path Tomb Raider like exploration experience but are very much a tourist attraction for the masses. Personally, we’ve never actually been up to Moon Hill, but even just seeing it from the road is impressive. There’s a better view of Moon Hill from outside of the park entrance than from inside, as the closer you get to it the harder it is to take it all in. Moon Hill is basically a giant archway at the top of a hill. Somehow part of the mountain eroded away and left a rock arch in its place. It’s quite a unique geological formation and an epic place to go rock climbing. You do have to pay to hike up Moon Hill. It’s not expensive, but I’ve always liked admiring the shape of it from the road and never felt the need to get up close and personal. Regardless, you should definitely head down the road and check it out, whether you pay to go in or not. If you’re looking for an incredible sunset view in Yangshuo there’s no better place than from the TV Tower at the top of Ma Shan. The mountain is located just behind town across from West Street. Just like Laozhai Mountain and Xianggong Hill, the hike to the top is via hundreds of stone steps. This mountain is a bit higher than the mountains in Xingping so I would allot 45 minutes to climb from the bottom to the top. Once you get to the top, don’t be discouraged when you come to a locked gate without much of a view. Say “hello” to make your presence known and a man will come out and unlock the gate for you for a small fee of 5 Yuan per person. Once he lets you into the TV Tower this is where the magic happens. The views from the tower are incredible! 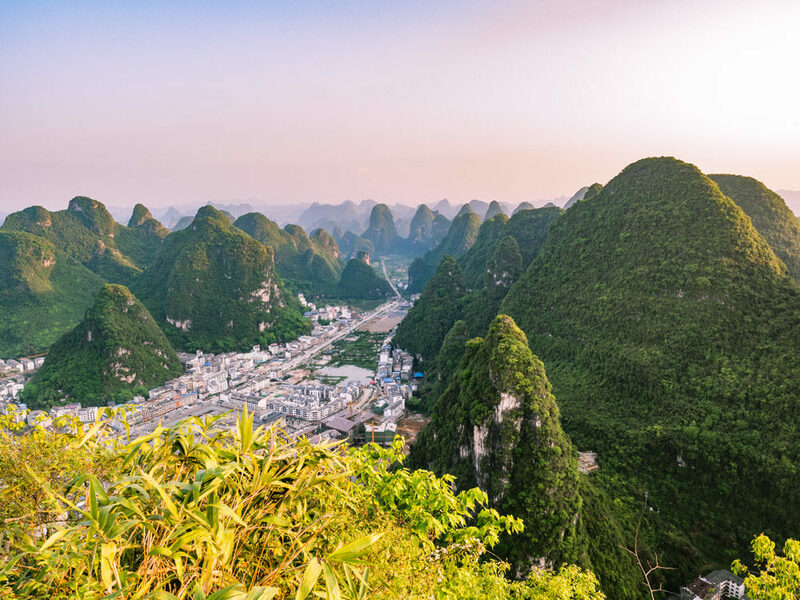 You can see almost 360 degrees around looking down on thousands of karst peaks, rivers, and, of course, on one side, the town of Yangshuo. 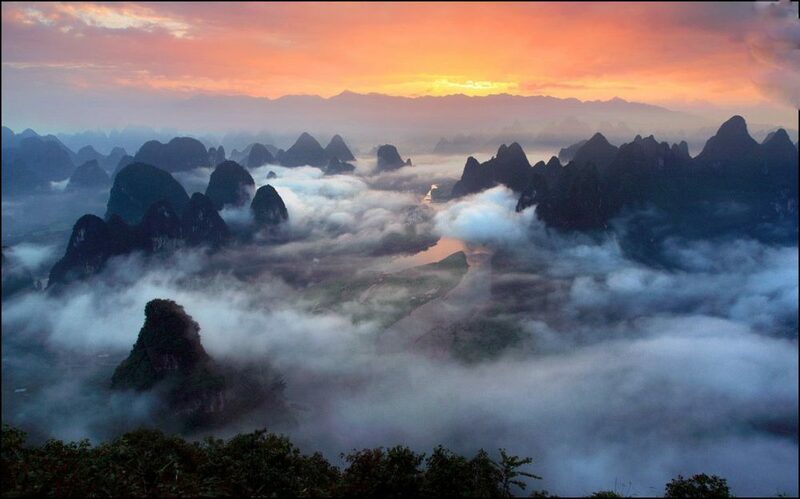 The sun sets opposite of Yangshuo Town giving you a stunning view of a pastel sky with beams of light cutting through the mountains. It’s definitely one of the best sunset views I’ve ever seen. Yangshuo is an amazing place for cycling. There are tons of back roads winding their way through the countryside with absolutely no traffic. The scenery is absolutely unbeatable, and since the mountains here are too steep to run roads up, the roads snake in between the peaks making for incredible views and easy rides. There are route lengths here for every fitness level. You can choose to ride along the river, through the mountains, or both. Bikes are cheap and easy to rent, and you can ride along paved roads or on trails through the rice fields. 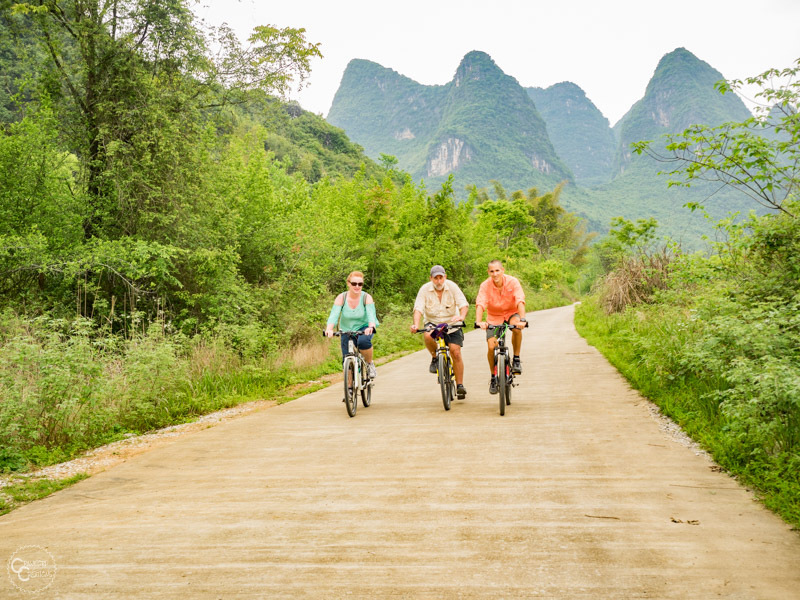 Cycling is the absolute best way to see the countryside around Yangshuo. Click here for maps of 3 of the best cycling routes in Yangshuo. 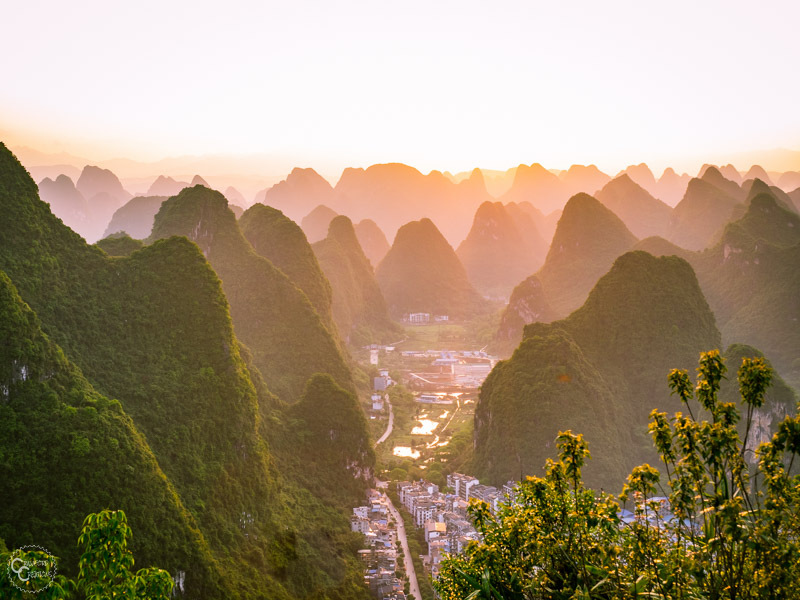 Located 25 kilometers from Yangshuo in the tiny town of Cuiping, Wuzhi Hill has another one of the best sunset views in Yangshuo. While the town of Cuiping itself is just a humble farming village, the locals have constructed steps up the side of one of the mountains there for easy access to one of the most stunning views around. To get to the top of Wuzhi Hill in Cuiping is just a short 20-minute climb, and the reward is incredible. While, of course, the view is beautiful at any time of day, if you come for sunset you’ll get to watch the sky light up with color as the sun sets over patchwork rice fields cut with meandering streams as thousands of karst peaks loom in the background. After seeing Laozhai, Xianggong, and the TV Tower, Cuiping offers a view that is uniquely different from the other accessible mountains in the area. 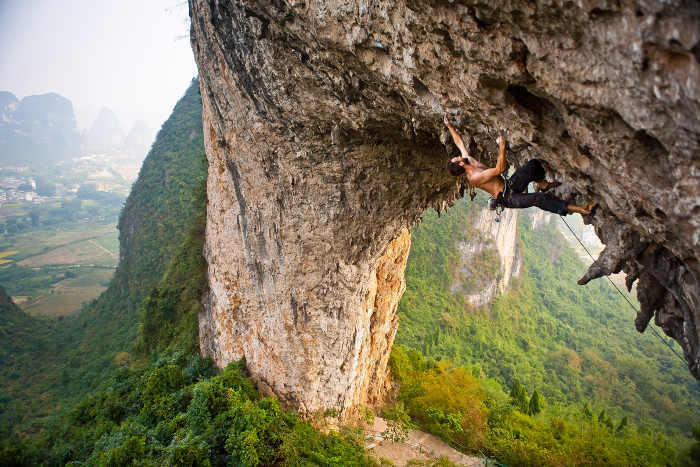 Yangshuo is famous in the rock climbing world for being a climbers paradise. I mean the mountains around town are basically all cliffs with tons of nooks and crannies that were basically born to be natural hand and footholds. There are over 200 marked climbing routes around Yangshuo. Experienced climbers can bring their own equipment and have a field day independently climbing up the hundreds of rock faces in the area. For those not so experienced, there are a few places you can go with a guide and try your hand at some easy climbs. There’s even one spot that’s set up and staffed all year round on the main scenic road where you can literally stop on the side of the road go rock climbing. 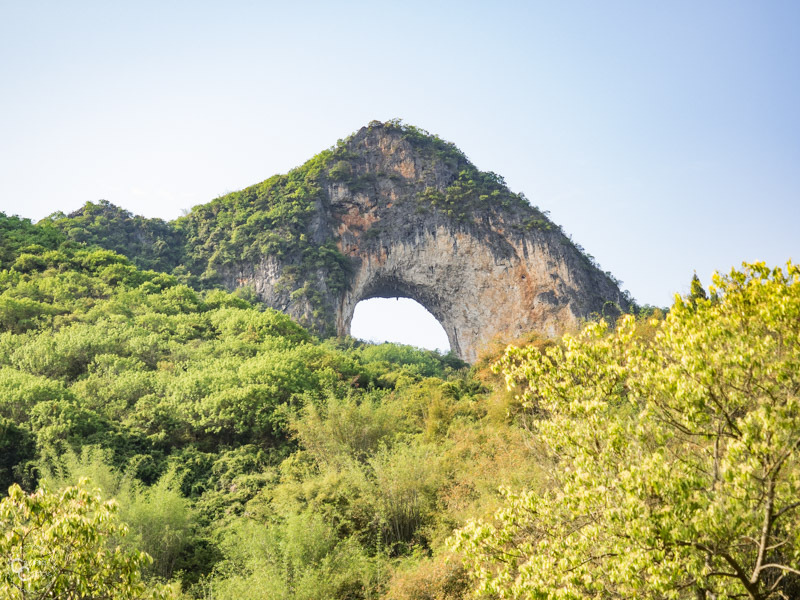 Whether you’re an experienced climber or just someone who’s always want to give it a go, Yangshuo is the perfect place to go rock climbing.